"The mischievous bunnies are back in a hilarious sequel that is guaranteed to be even crazier and funnier than the first – and with even more wacky games! 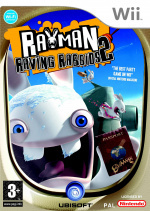 They've invaded the world of Rayman®, and now the insane Rabbids have a new objective: invade planet Earth! They have established their base at a shopping mall and begun training for their nastiest scheme yet. As part of this training, the Rabbids must carry out several missions around the globe to help them in an attempt to dominate the world. The Rabbids will also try to study human behavior by mimicking everything we do…but in the Rabbid sort of way, with no logic…of course. Back to battle the Rabbids and stop the invasion is Rayman, who will infiltrate the Rabbids by disguising himself as one of them. New wacky games: 60 brand-new games that spoof popular culture and are even wackier and crazier than those featured in the first Rayman Raving Rabbids. All-new party mode: Play co-op or battle your friends simultaneously with up to four players! Unique use of the Wii Remote™: Discover new and innovative ways to play with eight types of gameplay, including shaking, precision, dexterity, and balance. Rock Out with the Rabbids: Use the Wii Remote as your guitar, drums, or mic as you create and listen to music from the most popular bands around. Travel around the world: Take Rayman on a world tour to defend Earth and travel to different regions including the USA, Europe, and Asia. Challenge the Rabbids as they try and infiltrate everyday life. Customize Rayman and the Rabbids: Use more than 110 items including skins, hats, accessories, and clothes to dress Rayman, and to create your own Rabbid. Unleash your creativity with over 540K customization combinations."